I decided to make some wound markers for my Astral Claws as a quick Saturday morning project. Basically, the number of skulls/helmets represent how many wounds a character has remaining. 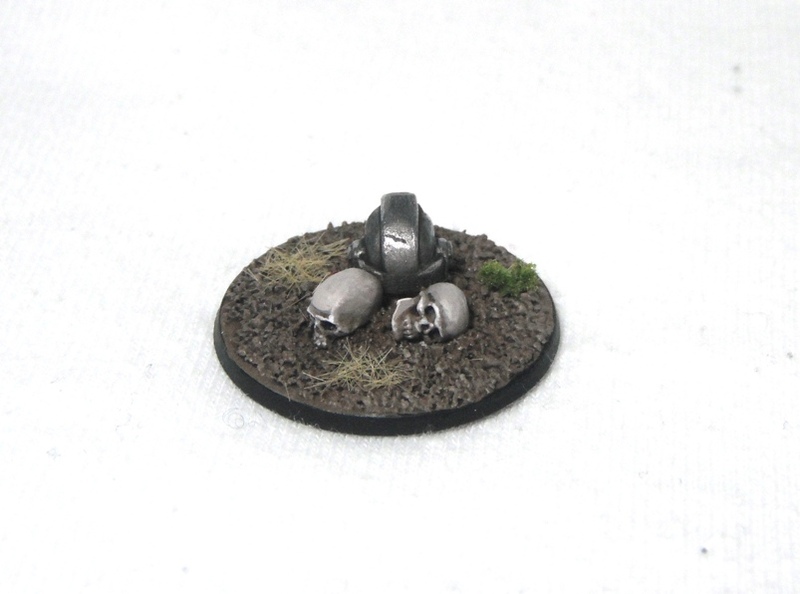 The skulls are taken from a number of kits (if you own any GW kits then chances are you have some skulls lying around somewhere) and the damaged helmets were taken from Chaos trophy racks. I could have used regular marine helmets but these had battle damage already sculpted on and so saved me a bit of time. The helmets were painted to match my Astral Claws models whereas the skulls were an opportunity to try out my new method of painting bone. Previously I had used Zandri Dust and Ushabti Bone for skulls, however, recently I have moved to using a basecoat of Baneblade Brown washed with Agrax Earthshade and then highlighted Baneblade Brown, Rakarth Flesh, Pallid Wych Flesh and finally White Scar. This produces a much paler, more realistic bone colour than the creamy/yellow look achieved with Ushabti bone. 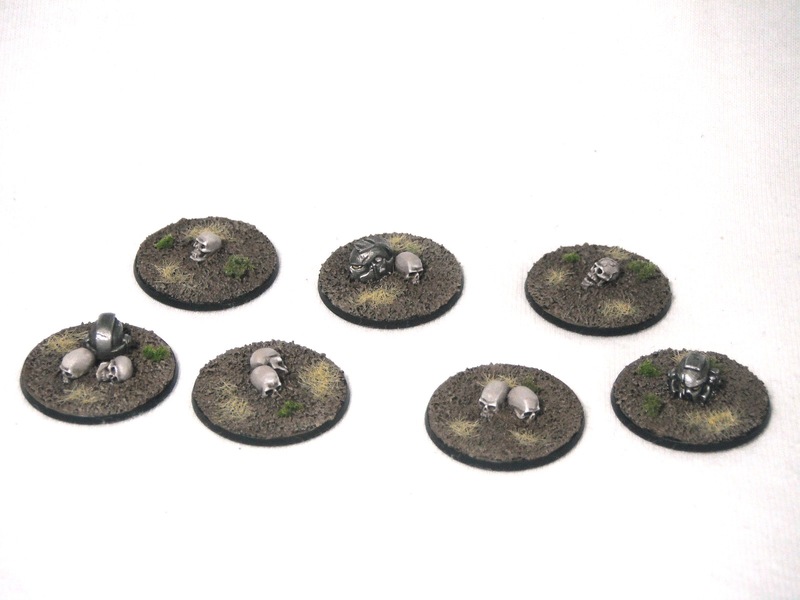 The ground texture was then painted to match the rest of my army. 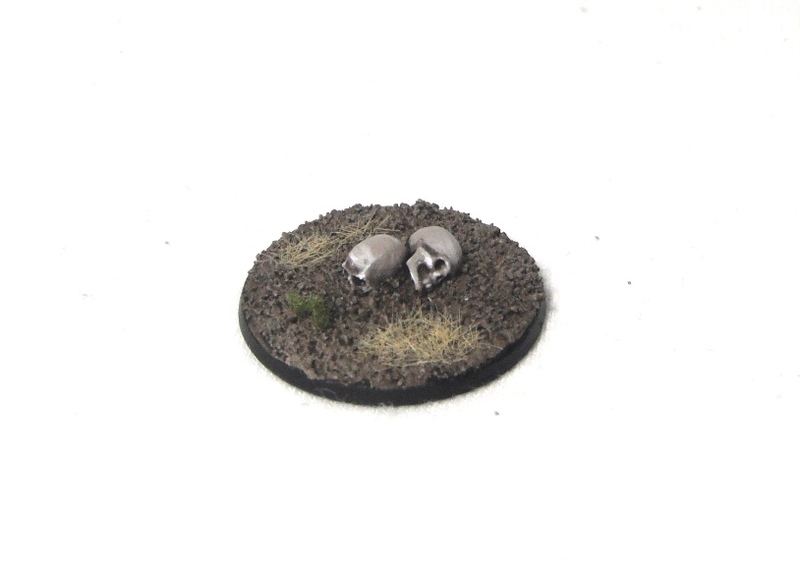 I plan on creating a few more themed gaming aides in the future including some objective markers converted from the Space Marine casualty models. Watch this space. 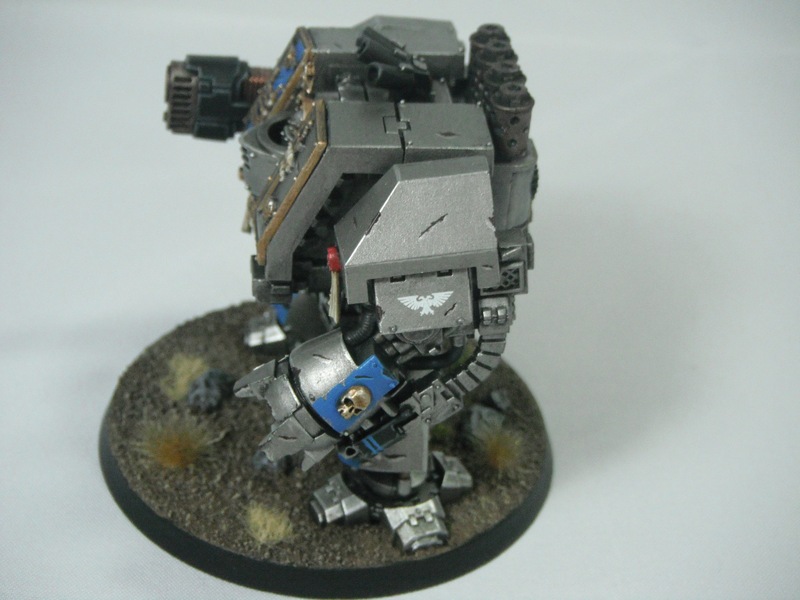 The Astral Claws dreadnought is now more or less complete. I will probably go back and add a freehand name to the scroll on the sarcophagus at a later date. However, at the moment I am distracted by the amazing new Harlequin models. 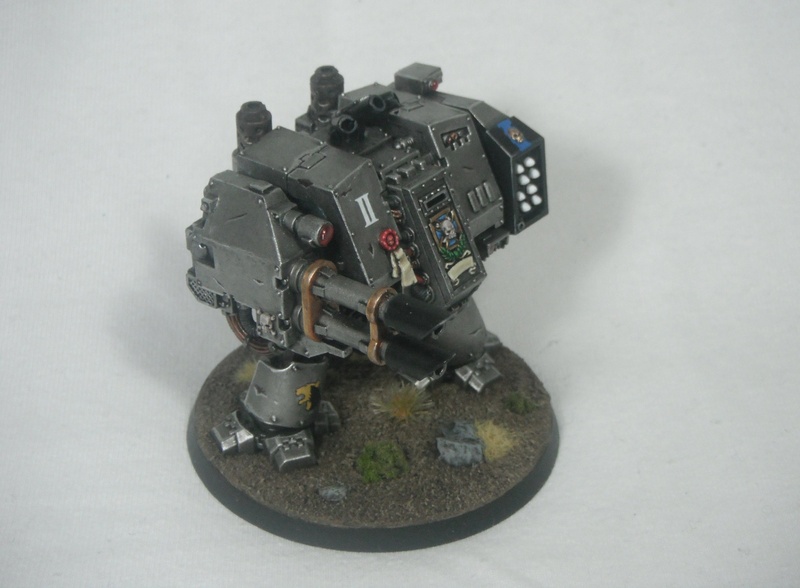 The model is equipped to provide long-range fire support with its twin-linked lascannon and missile launcher. 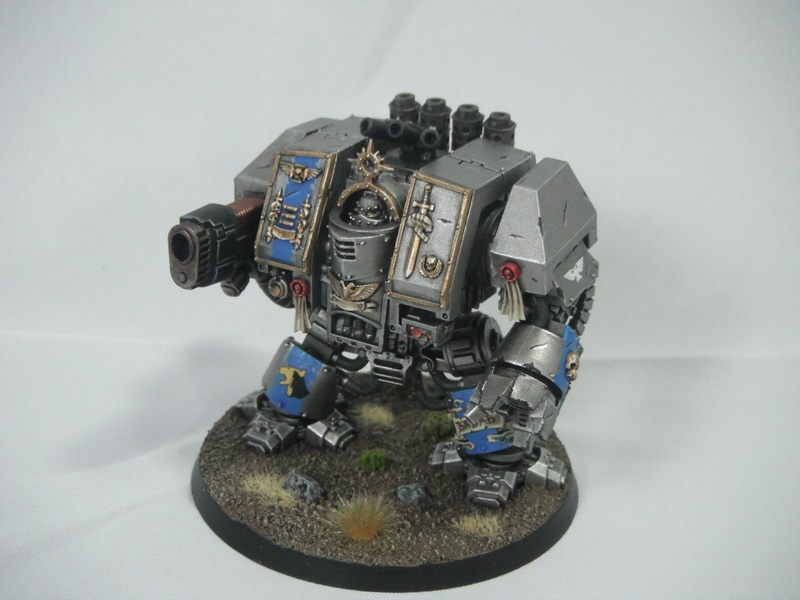 I opted for a lot less blue on this dreadnought than my first one. I think Astral Claws should be primarily silver and too much blue can overwhelm them. 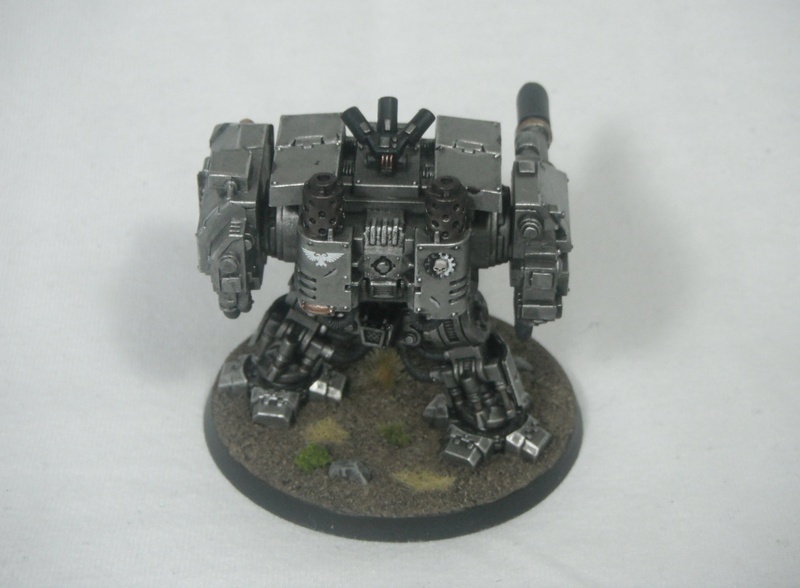 Also, as a standard dreadnought rather than a venerable one I wanted him to be less ornate. 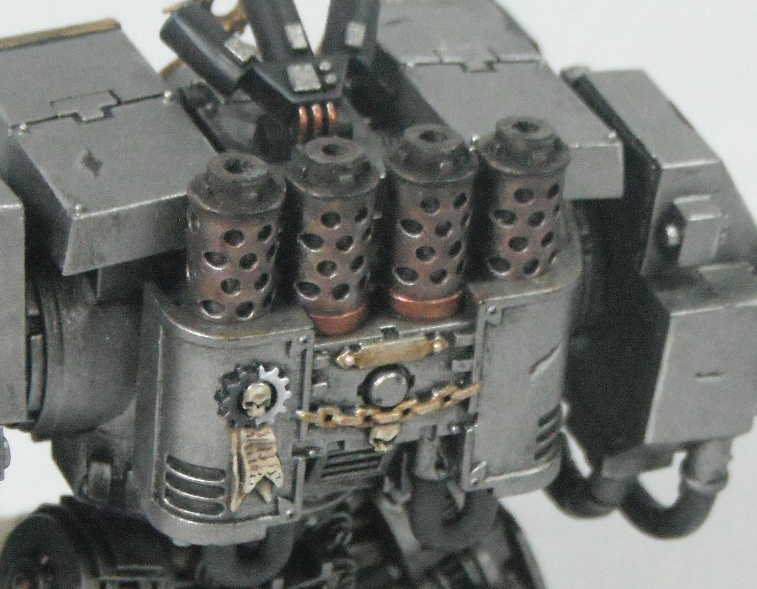 The engine stacks were heavily weathered with washes and Typhus corrosion to get a heat-stained, soot-covered look. 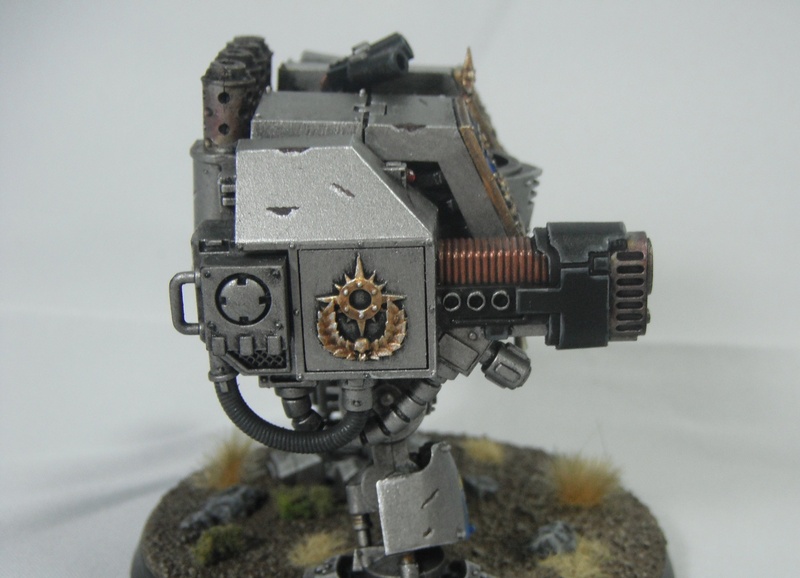 This adds a bit of texture to the model and distinguishes them from the other metal areas. 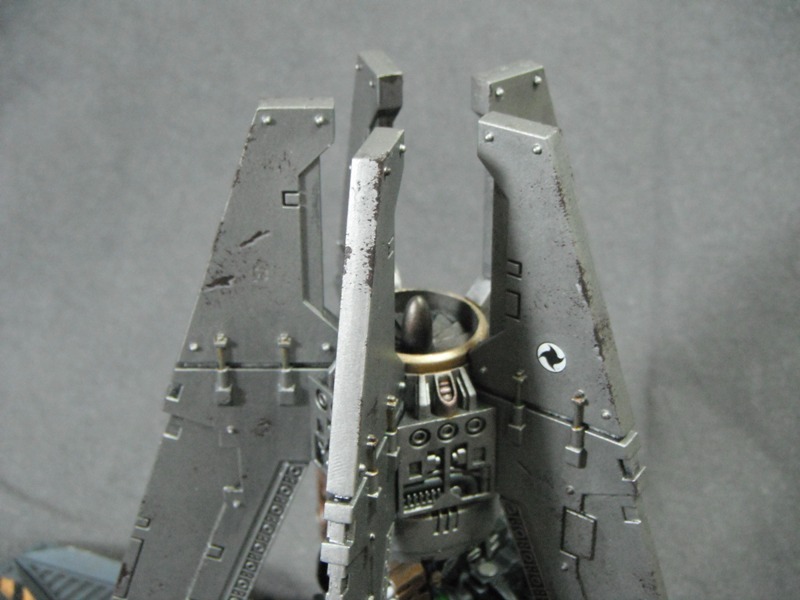 I also added a few sooty streaks to the exhaust vents of the missile launcher. 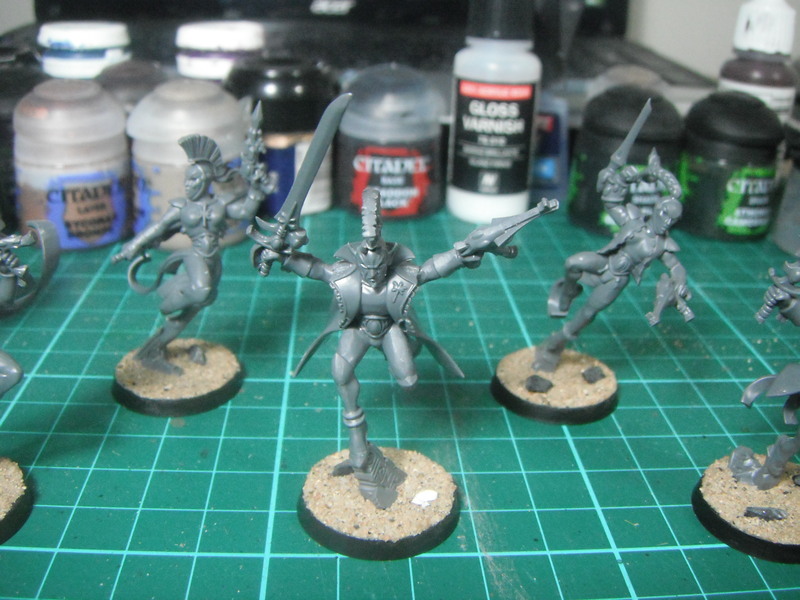 Here is a sneak peak of my next project (which you may already have seen if you follow me on Twitter), Eldar Harlequins. 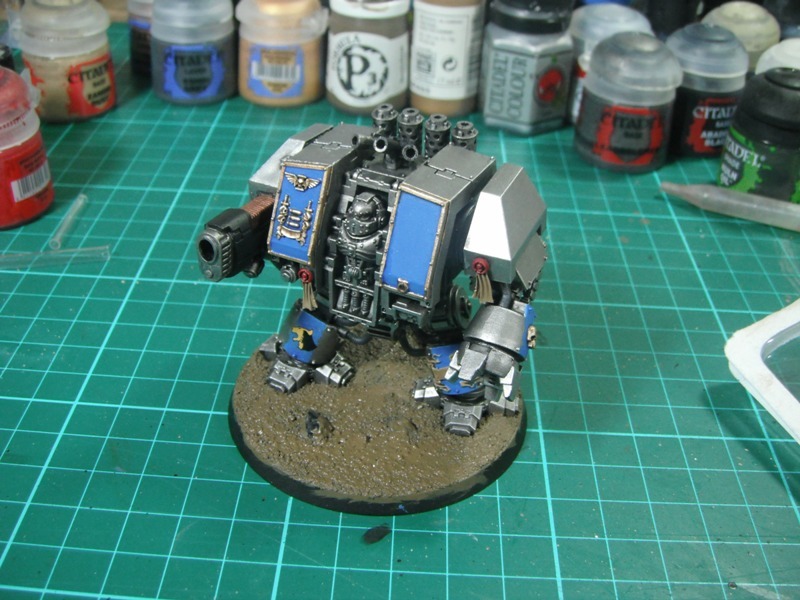 Here’s a picture of my latest space marine dreadnought in a very early stage of painting. This one is kitted out for long range fire support. 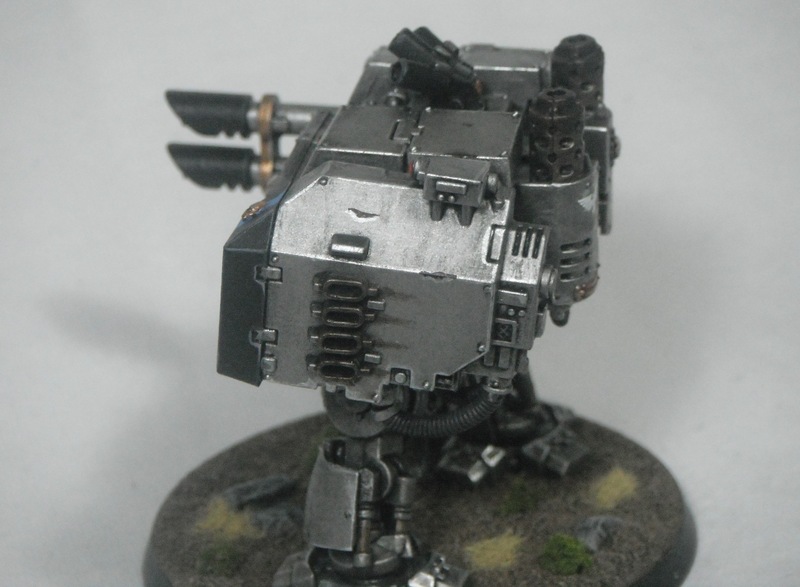 He’s primarily intended to take out heavily armoured targets but the missile launcher adds a little flexibility to his armament. I’ve made some progress on the space marine tactical squad. All of the main colours have now been blocked in. I just need to do a bit of highlighting and they’ll be finished. I was reminded the other day that I haven’t updated the blog in a while. This is because I haven’t really had much hobby material to show. Work continues slowly on the ork fleet but their isn’t much to see at this stage which is significantly different from the pictures already published. I’ve just blocked in a few colours prior to shading and highlighting. 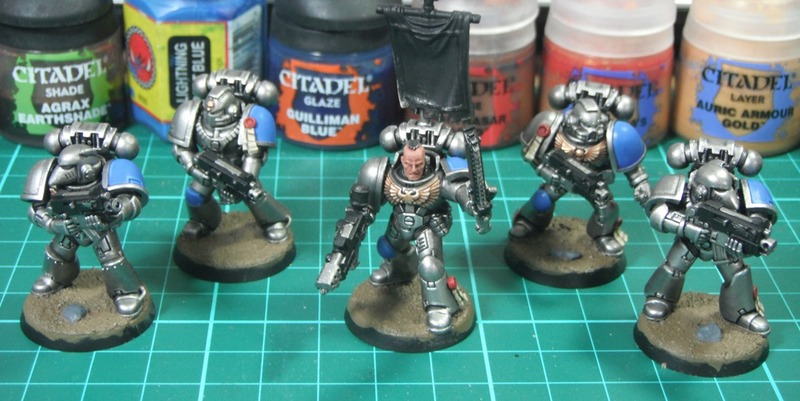 However, something I have been working on is more space marines for my Astral Claws. These guys have become my go-to models when I’m between projects. The space marine kits are great fun to assemble and the newer tactical squad kit is no exception. I won’t write a review as these models have been out nearly a year now but the kit has very crisp detail which far surpasses the previous incarnation of the tactical marines. 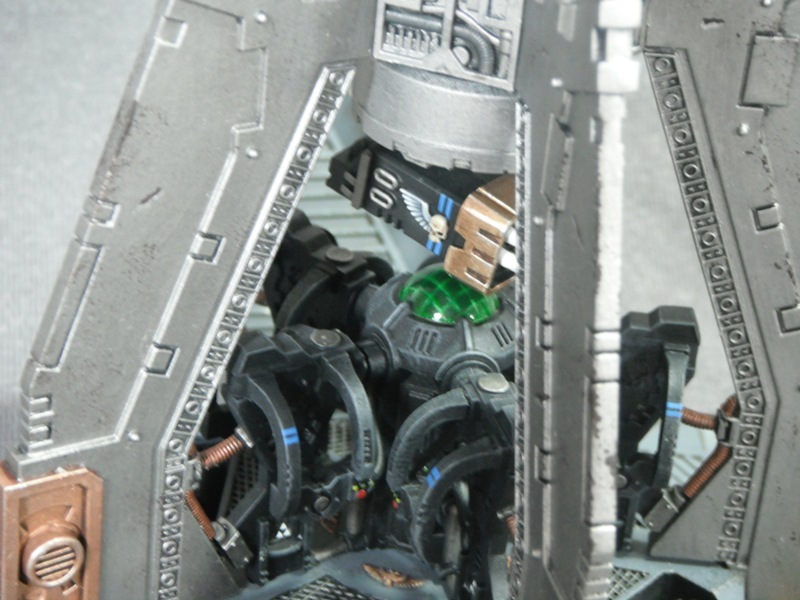 There are some subtle details which might be missed when looking at the photos in White Dwarf. The poses are more upright making them appear taller and the unarmoured heads are ever so slightly smaller, giving the models better proportions than the older kits. One thing I also really like about the kit is the number of early armour mark bits included in the kit and I have made full use of the mk4 and mk6 components to add variety to the force. 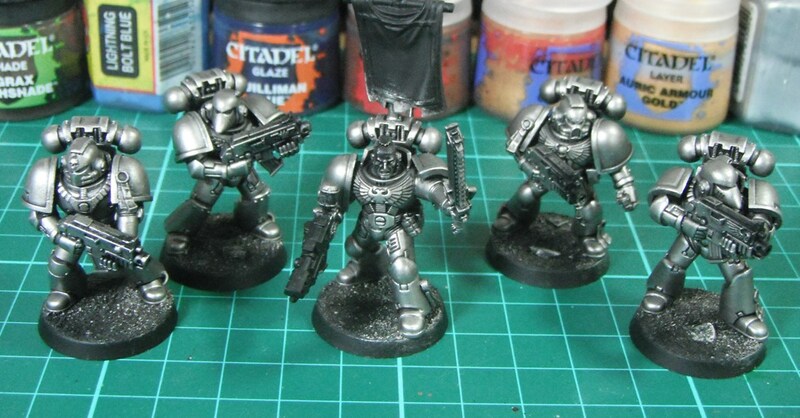 So far the silver armour is complete on these models and I will be moving on to the blue and gold detailing. More to follow. 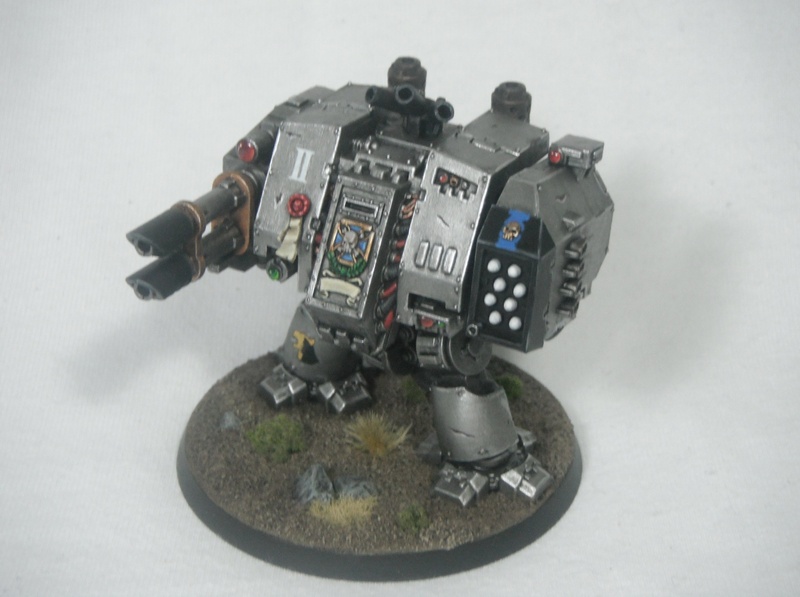 I have finished my Venerable Dreadnought. Thanks to everyone who commented on my previous post, your suggestions were much appreciated. As you can see, in the end I did decide to swap one of the armour panels and repaint the other in order to make the overall appearance less blue. I decided that this was worth the effort (and risk of damaging the model). I think it just shows that there are times when, despite the time and effort you have put into a model, you need to go back and do things again in order to get the best finished result. He now looks like a proper Astral Claw and not an Ultramarine. The left panel was carefully removed and replaced with a new one which was then painted silver. This was done because the other one had already been given a coat of gloss varnish in preparation for a decal and so I couldn’t repaint it without it looking a mess. The panel on the right then had two strips of silver painted along each side to leave a stripe of blue down the middle rather than the whole panel being blue. Not only does this tone down the effect of the blue but it also better matches the Forge World artwork which shows the Astral Claws with blue vertical stripes on their vehicles to break up large armour panels. The engine was painted to simulate heat discolouration on the metal. 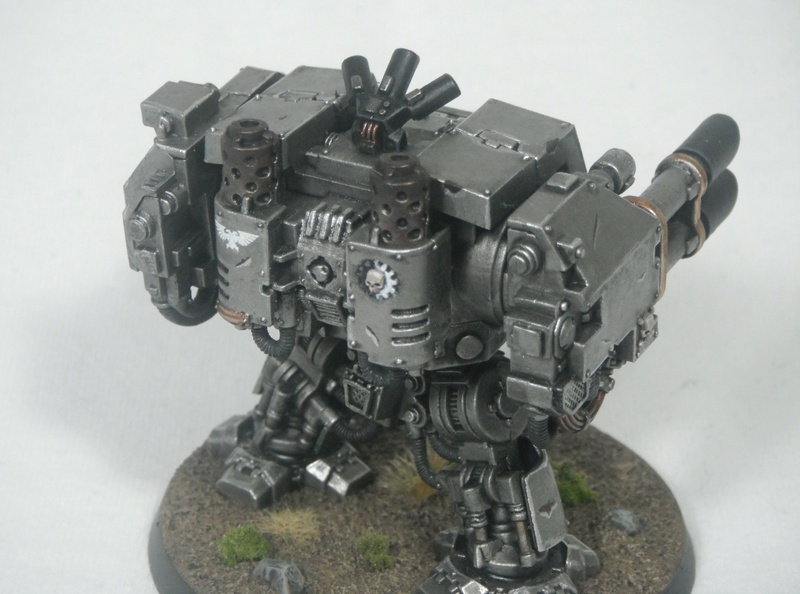 In order to achieve this I painted the engine stacks Leadbealcher and, when dry, applied a number of washes. 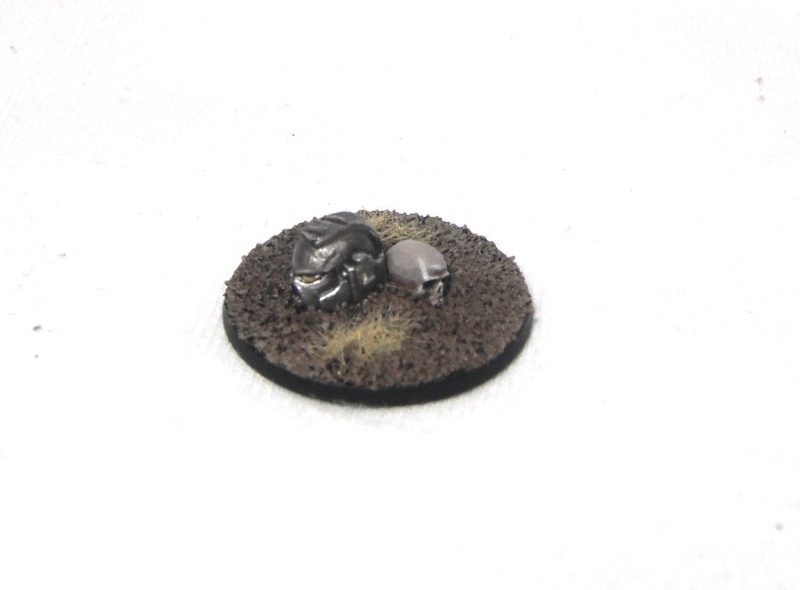 There were, in order, Seraphim Sepia, Ogryn Flesh, Leviathan Purple and Agrax Earthshade. The trick is to use less wash each time so that some of the previous colour is still showing. I also used this technique on the end 0f the plasma cannon working towards the front of the barrel. The soot at the top of the stacks was painted on using Typhus Corrosion followed by a wash of Nuln Oil. I’m really pleased with the dirty, grimy look which has real texture to it. 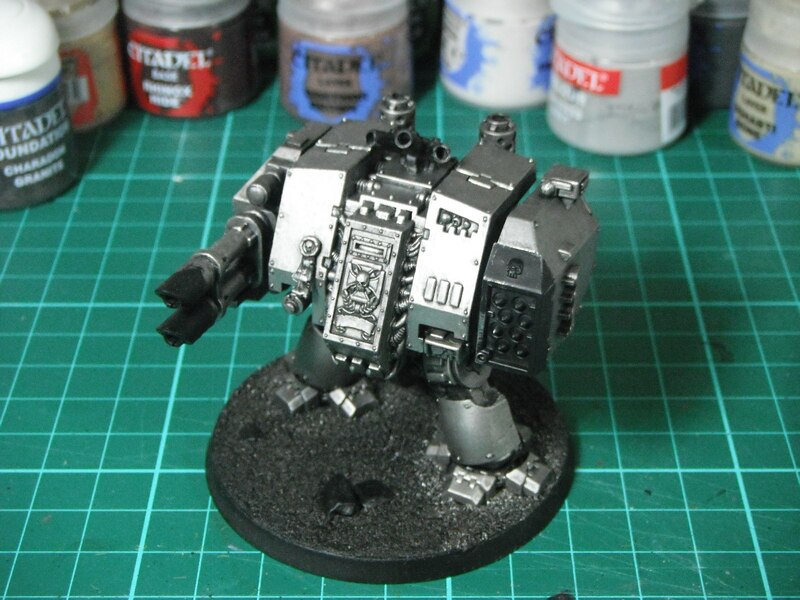 As this is a Venerable Dreadnought I decided to try and reflect the chapter’s history on the model. 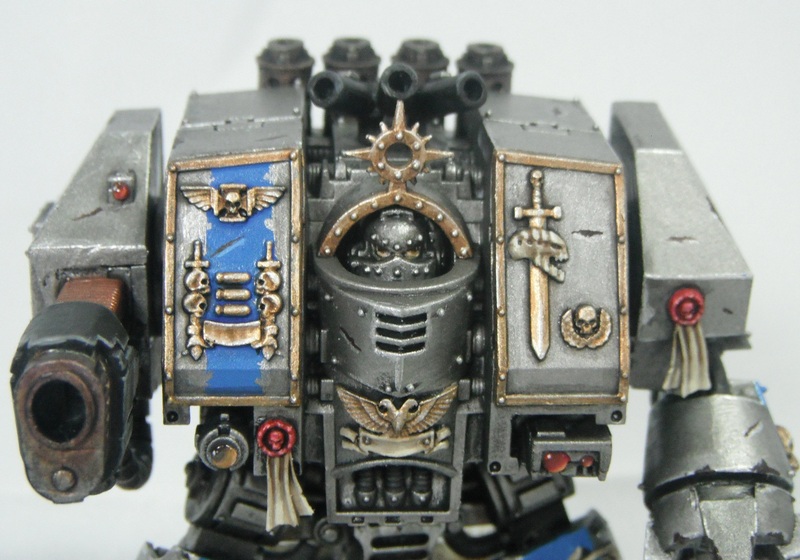 I used the original Astral Claws heraldry rather than Huron’s personal heraldry which was later adopted by the chapter. 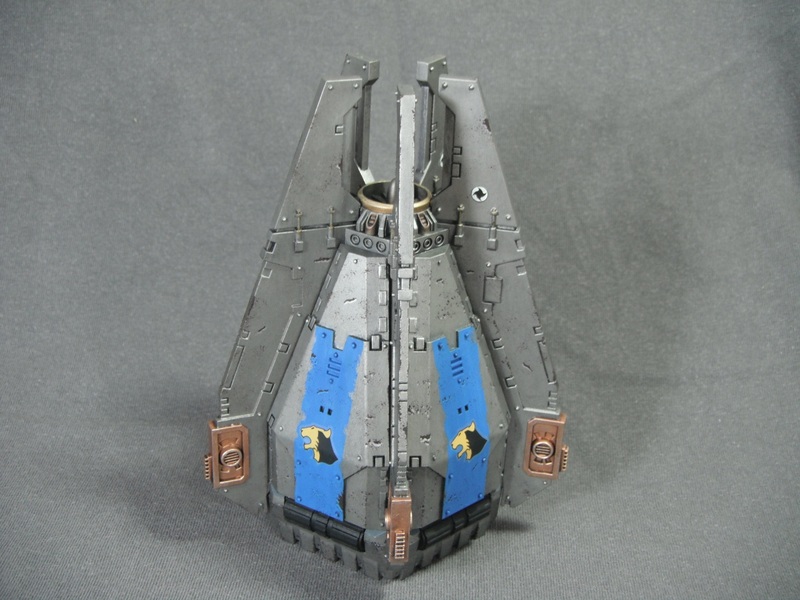 For this I used a Forge World decal over a blue stripe. 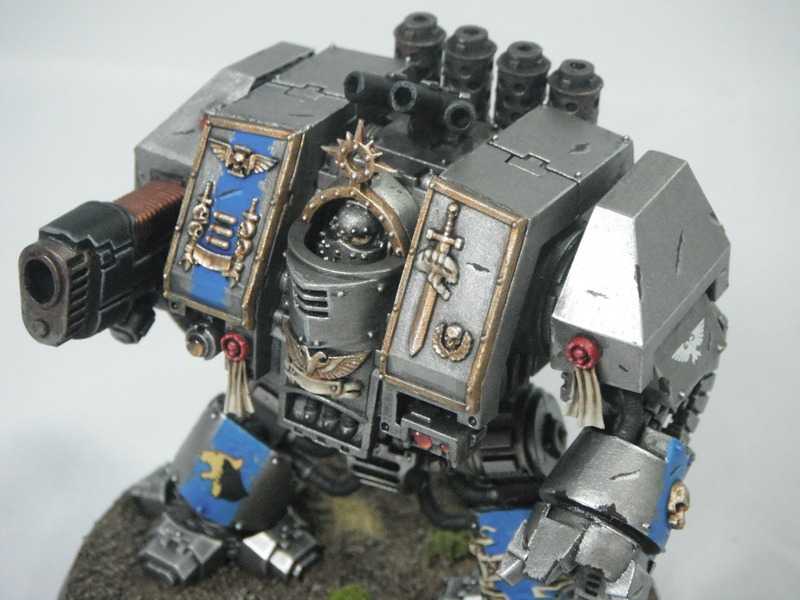 I imagine him as an old veteran from when the chapter was fleet-based and that it was during this time that he fought against the Tyranids and ended up entombed inside a dreadnought (hence the honour badge on the sarcophagus). 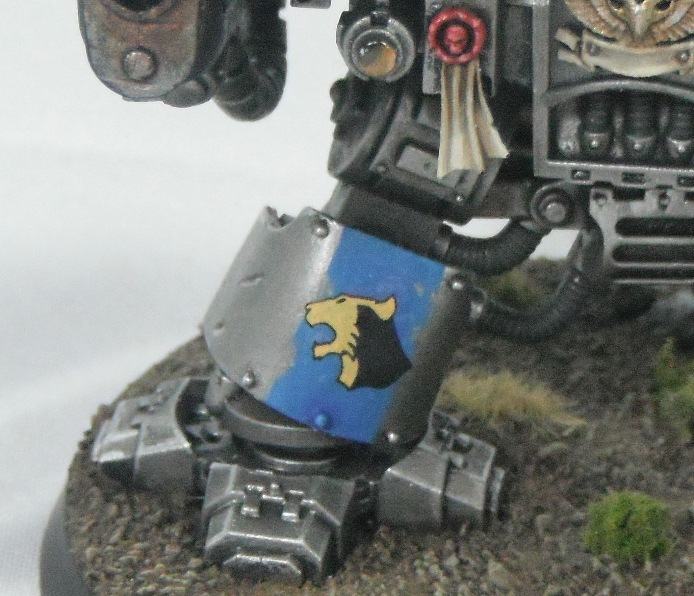 I also painted the name of the chapter’s new homeworld to his other leg as a nod to this later stage of the chapter’s history. this reflects the way that in the background the dreadnoughts are living embodiments of their chapters’ histories. 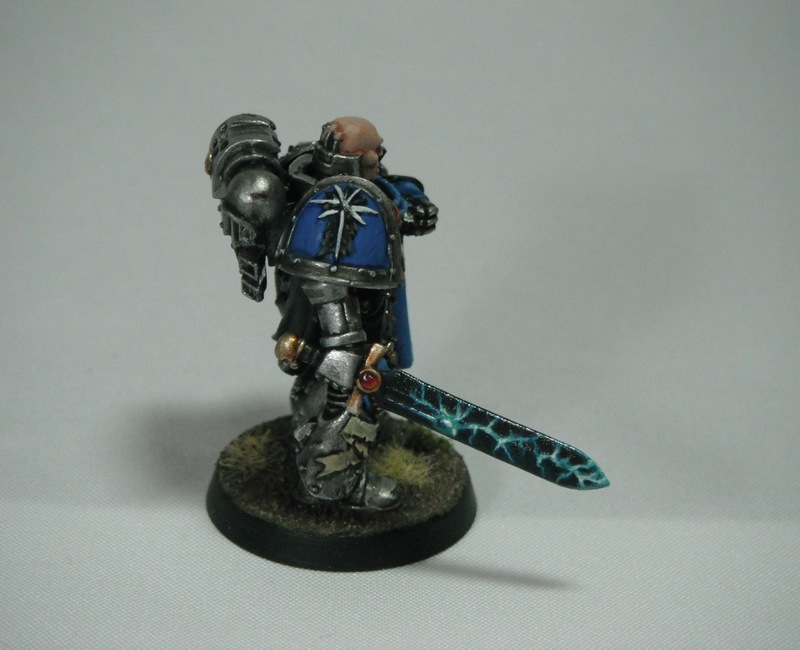 His power fist also has a blue stripe painted down it to help balance out the blue areas elsewhere on the model. 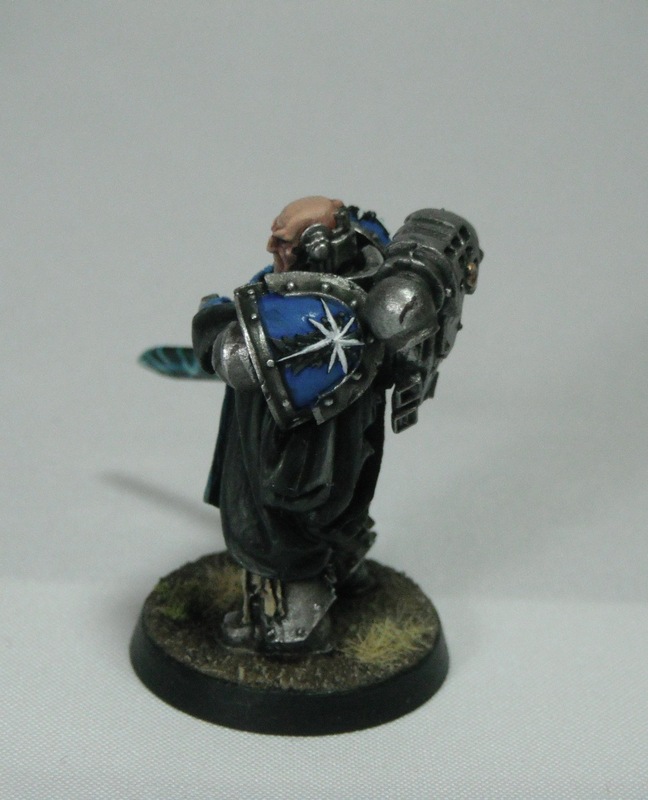 Originally I was going to paint blue stripes on the shoulders (as Leeman suggested in the comments) but I decided that as I had already painted blue onto the power fist I would leave them plain so as not to over do it on the blue again. 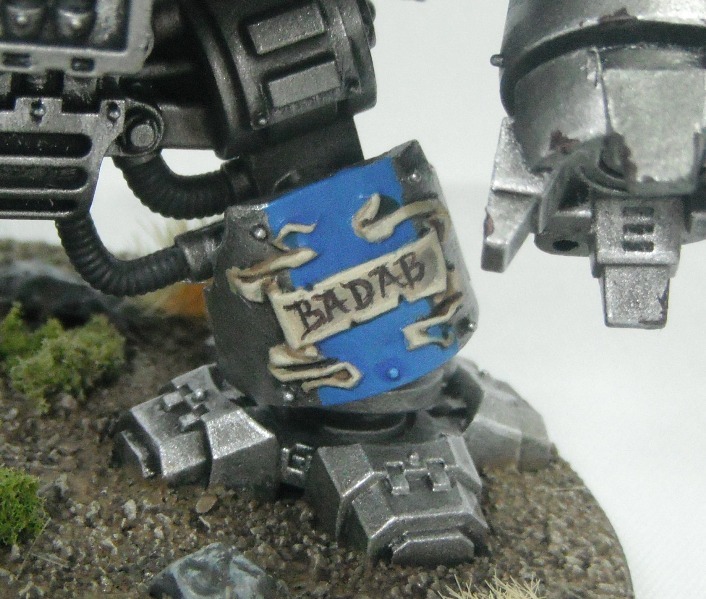 Instead I added a small Imperial eagle decal to provide a bit of interest and painted on some freehand battle damage. The blue stripes on the storm bolter ties it in with other weapons carried by marines in my force. And that’s it. Overall I am very pleased with how he turned out and it was definitely worth going back and redoing certain parts to get the right result. Those of you who follow me on Twitter (@Mini_Miscellany), will have seen this already. I’m quite pleased with how he’s coming along but I’m not entirely sure about the blue panels on the front. I think they make him look a little too blue when viewed head on. However, I am reluctant to go back and change them at this stage. I think today I’ll take a break from him and focus on some Lord of the Rings miniatures instead and come back to him later. 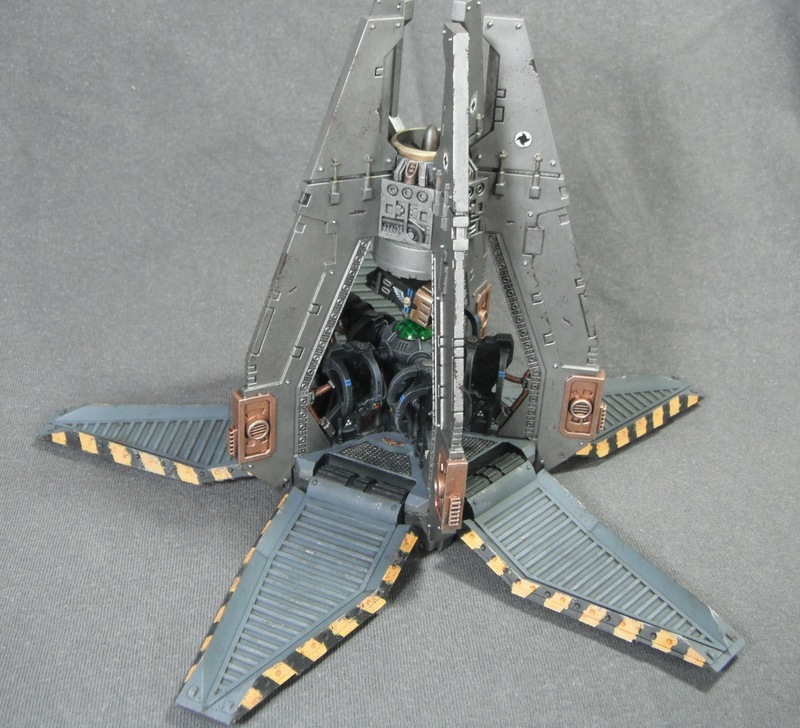 I’ve finally finished my Astral Claws drop pod. This has been quite a time consuming project, partly because of the size of the kit and partly because of the number of sub-assemblies required to paint the kit while still allowing access to interior details and other hard to get to parts. Initially I was worried that the model would look too silver but i think the blue stripe breaks this up nicely and matches the Forge World artwork. The weathering also adds an extra dimension of detail to the large, flat areas and makes them more interesting. 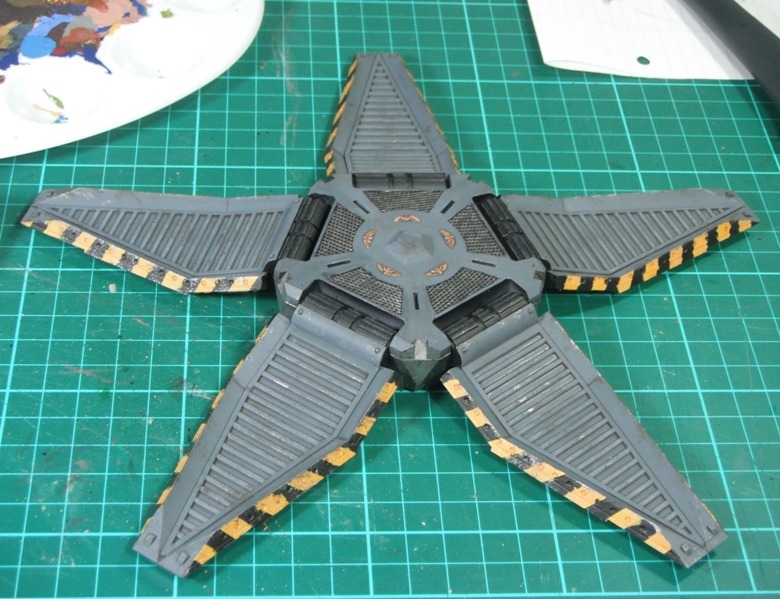 Overall, this has been a very enjoyable and rewarding project and it was very satisfying to glue together the various sub-assemblies and finally see the finished result. 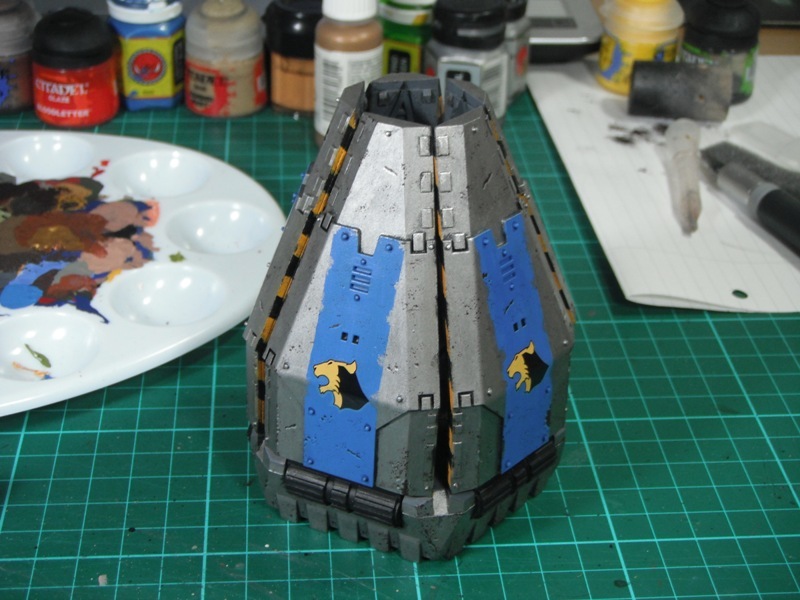 Currently progress on a drop pod for my Astral Claws. 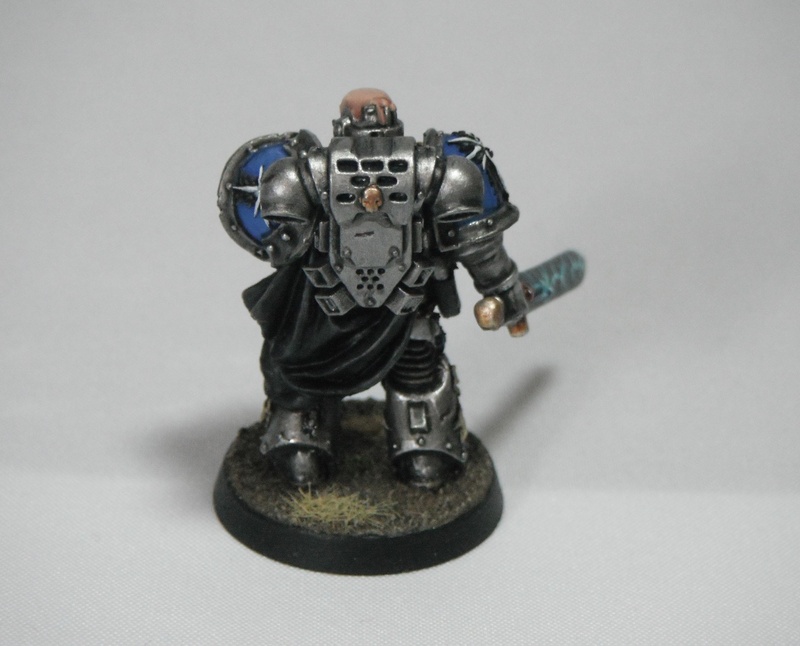 Here is my Astral Claws Captain. 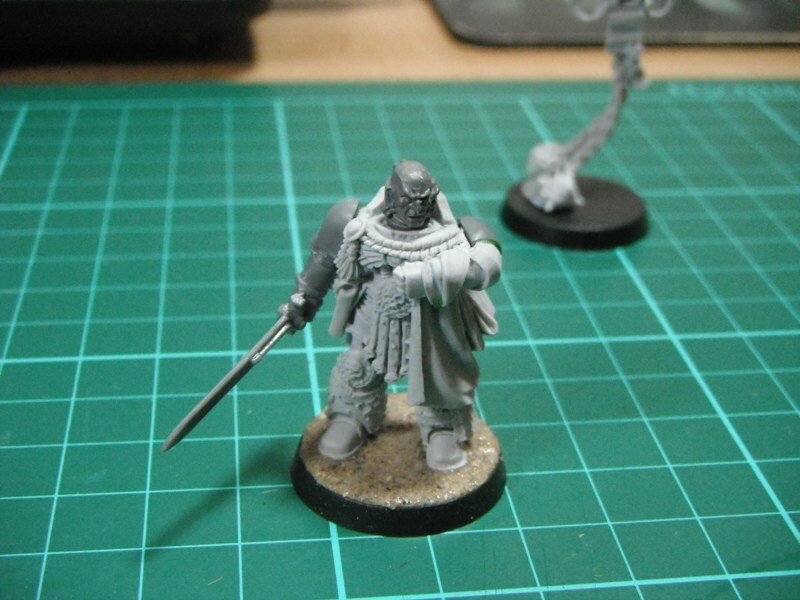 he is converted from the Master of Rites model. The inspiration for the conversion came from a Golden Demon entry, the only thing I have done differently is add some of Forge World’s Astral Claws shoulder pads. 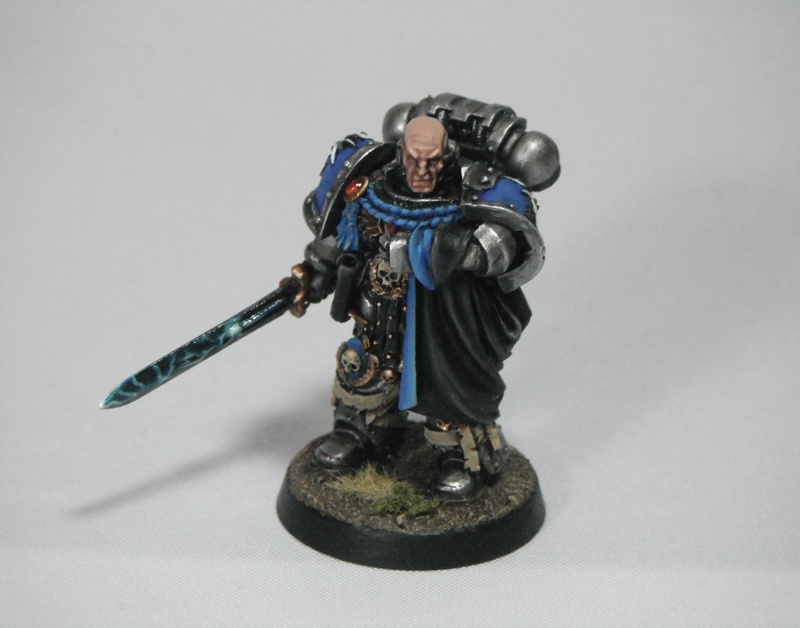 One of the things I really like about this model is the expression on his face: he has a ‘sneer of cold command’, to quote Percy Shelley, which is perfect for an Astral Claws captain. This, combined with the pose of the Master of Rites model, exudes an air of superiority and arrogance. This illustrates how a simple conversion (just a head and arm swap) can dramatically alter the dynamic of a model.